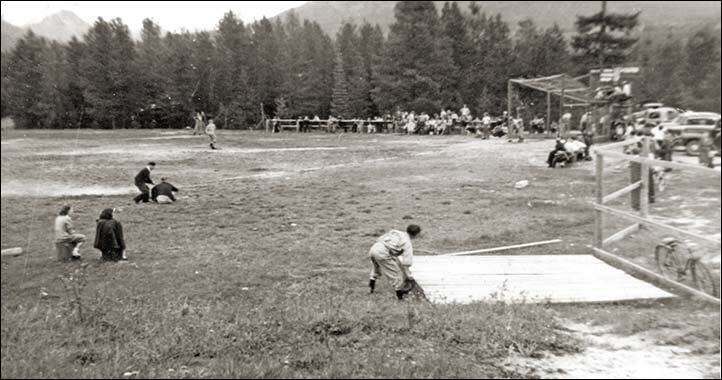 The Vancouver Sun provided wide coverage of local baseball, from Little League on up. On August 15, the paper highlighted members of Collingwood's Juvenile team. Left to right - Kenny (Kerry?) 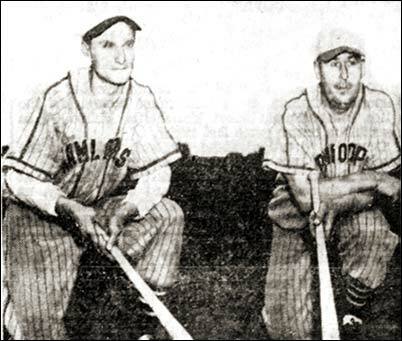 Parsons, Stan Black, Carl Homenuke and Pete Eades, who would advance to play in Senior "A" leagues. Pitcher Ted Bowsfield of Penticton was a high schooler with a bright future in baseball. He was just 15 when he began his "Senior A" baseball career pitching for hometown Penticton in Okanagan baseball. His first season was cut short by an arm injury after just four starts, two of them complete game victories. 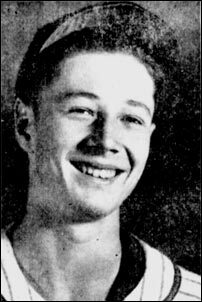 At age 16, Bowsfield was the ace for the Penticton Athletics in Senior A ball in the Okangan Mainline League in 1951. He topped an outstanding season (10-2, 14 starts, 11 complete games, one of the losses was a 1-0 decision) with a no-hitter in the playoffs. He was even better in his second summer with Penticton firing two no-hitters, one of them in the playoffs. He had tossed a two-hitter with 19 strikeouts to clinch the pennant for the Athletics. In 1953 he had a one-hitter, two, two-hitters and a three-hitter in his first four complete games but sat out a portion of the summer with arm woes. He started out 1954 with a 5-1 record,1.83 ERA and the Red Sox came calling and the left-hander was on a path to the major leagues. Bowsfield went on to pitch in the major leagues with Boston, Cleveland, Kansas City and Los Angeles. He won eleven games with Los Angeles in 1961. 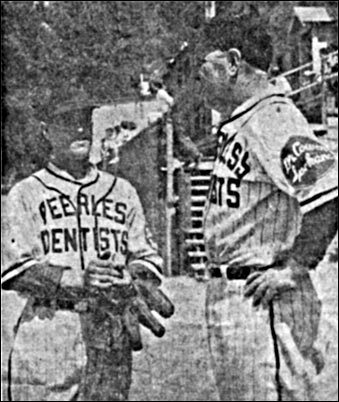 Above left - Nelson Peerless pitcher Les Hufty (left) and coach Gordie Richardson talk strategy in a game against Rossland Cubs. The Cubs won 4-3 with Hufty pitching a complete game. 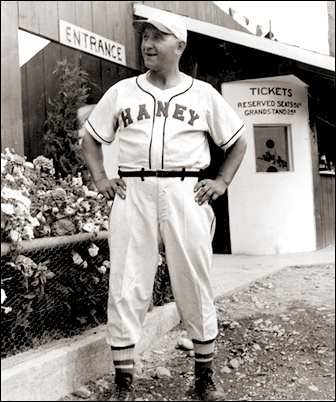 Above right - Pete Telosky in the 1950s after he had taken a parcel of his own land and built a ball park for Haney. His "Field of Dreams" for the community. Check out the story at the Maple Ridge Archives. Lining up with the Kamloops Elks at the Lacombe Tournament, pitcher Joe Kanik (left) and first baseman Casey Jones.